So, I’m officially graduating in two days, and in the whirlwind of wrapping things up, I haven’t had much time to read. 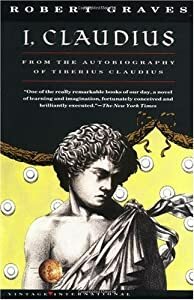 Right now, I’m over 100 pages into Robert Graves’ I, Claudius, and since it’s quite a long book, I thought that it would be best to post my reviews in installments, like I did with Tender is the Night. Published in 1934, the novel is written in the form of Claudius’ autobiography. Claudius was Roman Emperor from 41-54 CE, but due to his infirmities, suffered a poor reputation. With a stutter, limp, and nervous tics, his family considered him useless. However, much to everyone’s surprise, Claudius was also a well-read intellectual. Inspired by the historians before him, Claudius’ autobiography covers the entire story of his oh-so-famous royal family–which included Julius Caesar, Augustus, and Caligula. So one word of warning: if you’re not familiar with this monarchy, keep a family tree in front of you while you read. The book holds A TON of names, many of which are extremely similar due to Roman customs. Did you know that women had no choice whatsoever when it came to their names? If you were a man named Julius, all of your daughters would be named Julia, and it was your job to give them nicknames or just call them “Julia the Elder,” “Julia the Younger,” and so on. Thus, Claudius’ full name is Tiberius Claudius Drusus Nero Germanicus, all parts of which come from other relatives. Confusing, right? I’m not going to lie to you: this novel takes a while to get going. Robert Graves does an excellent job in imitating the Roman writing style (I swear, every ten pages I have to remind myself that this is fiction, because it sounds like it was literally translated from a Latin text). Unfortunately, this devotion to style might turn many readers off. I had one friend take one look at my book, and ask, “You’re reading that for fun?” Apparently, she was forced to read excerpts in a college class, and considered it more of a textbook than a beach read. I agree: I, Claudius is not a beach read. It’s heavy, weighty material about a historical time period most people never learn about. But I’m not afraid to admit that I’m a total nerd, and I love all the Roman references. Livy! Ovid! Cicero! Call me crazy, but I can’t get enough of that stuff! I’m glad I kept reading, because once Claudius stops with the ancestor stories and starts discussing his own adolescence, the novel becomes much more intriguing. He suffers through constant bullying, difficult disabilities, and the shadows of more beloved siblings. Even after catching a break by falling love with his first fiance (at the ripe age of 13), she gets poisoned on the way to the wedding ceremony. You just want to give the guy a hug! I should also mention that I’m enjoying I, Claudius more because when I was taking Advanced Latin at UC Santa Cruz, I translated Seneca’s Apocolocyntosis (yes, try saying that three times fast!). The title translates to the “pumpkinification,” meaning turning into a pumpkin rather than a god. It’s a hilarious Menippean satire which portrays Claudius as a cruel, idiotic leader. Granted, Seneca was actually banished by Claudius, so you have to take the tale with a grain of salt. Neither man was innocent in their volatile relationship. But I find it interesting to compare Apocolocyntosis to I, Claudius, especially since one is an original Latin text and the other is a 20th-century fictional autobiography. Ok, well this post turned out longer than expected, but as of now, I’m slowly liking this novel and look forward to reading its progression. Don’t let me nerd out all by myself–share the Latin love and let me know what you think! This entry was posted in Book Review and tagged Apocolocyntosis, autobiography, book review, Claudius, Robert Graves, Roman history, Seneca by Book Club Babe. Bookmark the permalink. I wouldn’t mind reading this actually. I remember seeing bits of the BBC series based on it, many many years ago, and laughing at how terrible the filming was hahaha, but I think reading it would be more enjoyable. Have you seen the HBO show “Rome?” If not, you really should, because it’s the best screen adaptation of Roman history I’ve ever seen! Season One leads up to Caesar’s assassination, and Season Two covers Augustus v. Antony…it’s amazing! I am excited that you have read I, Claudius and I encourage you to read the sequel Claudius, the God. Robert Graves wrote these books at a time when writers took less license than today in recreating history. Graves tried to present Claudius, an imperfect soul, in an imperfect time. After all, Caligula made love to his sister and had his horse elected to the Senate. Well, I’m not done with the novel, which is why I’m posting my reviews in installments. But hopefully, I’ll be able to read the sequel sometime!